The following workouts will progress from shorter intervals of effort to longer intervals with the goal of maintaining a faster running pace for longer amounts of time. Here are 8 workouts, one for each week before the TMC Meet Me Downtown 5K on Saturday night, June 1. Always prepare your muscles for a harder effort session by running easy for at least 10-15 minutes beforehand. For a complete warm-up, include some dynamic stretching and strides. It’s not unreasonable to spend a good 20 minutes warming up. After the workout, your body recovers better when you bring it to a gradual stop, by running easy for 10-15 minutes, rather than a sudden stop and drop and possibly not be able to get up again routine. 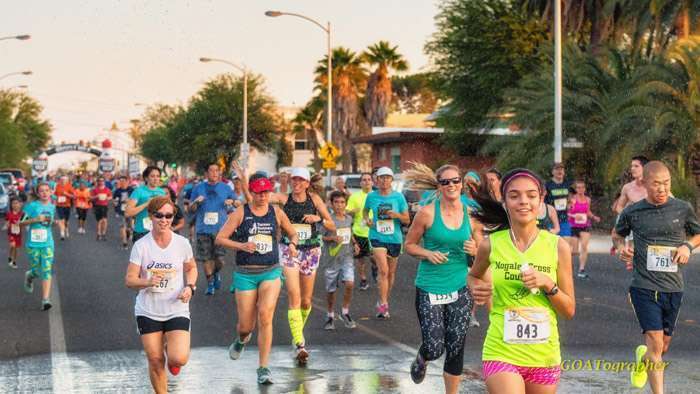 Don’t forget to tag us @runtucson @runsar #MMD5K so we can cheer you on! Workout 1: Minute to Win It. 1 minute hard + 1 minute easy x 6-8 sets. For this workout you alternate running a comfortably hard effort for 1 minute with running an easy/recovery effort for 1 minute. Always keep moving between intervals, even it it’s a walk- don’t stop. You can do 6, 7 or 8 sets depending on how long of a workout you are ready for. Total workout time= 6 sets will be 12 minutes of running and 8 sets will be 16 minutes. Workout 2: You Two Fast! 2 minutes hard + 2 minute easy x 4-6 sets. For this workout you alternate running a comfortably hard effort for 2 minutes with running a recovery effort for 2 minutes. Always keep moving between intervals. You can do 4, 5, or 6 sets. Total workout time= 16 minutes if you do 4 sets up to 24 minutes if you do 6 sets. Workout “Be 3”: 3 minutes hard + 2 minutes easy x 3-5 sets. Workout “4 is More”: 4 minutes hard + 2 minutes easy x 2-4 sets. Workout “High 5”: 5 minutes hard + 3 minutes easy x 2-4 sets. Workout “The 6 Fix”: 6 minutes hard + 3 minutes easy x 2-3 sets. Workout “Sending 7”: 7 minutes comfortably-hard + 3 minutes easy + 7 minutes harder. Workout “Gr8”: 8 min. comfortably-hard + 3 easy + 4 minutes hard + 2 easy + 2 min. hard. Workout 9: The Meet Me Downtown 5K Night Run!! !